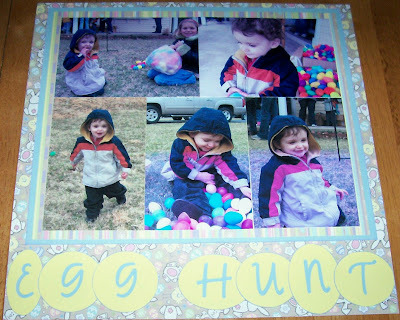 Confessions of a 20-something Scrapbooking Mother: Aaron's First Egg Hunt! Here is a layout from Easter-I'm so behind! This was Aaron's first Easter egg hunt, and he had a blast. He did not want to give his eggs back!! He wouldn't even let me count them, he kept throwing his body over all the eggs, lol. My kid is a trip. Both patterned papers are from Moxxie. I love how it shows you the front AND the back of the bunny. :) Too cute. I cut the letters with my Opposites Attract cart, which has quickly become my favorite font cart. I've don't 3 layouts just this week with OA, and they are all completely different. I cut these with the upright circle feature. You can't see it in the photo, but I also inked the edges of the mat and the circles with light blue Studio G ink that I got for one whole dollar! Studio G is awesome! Well, that's all for now. I'm hoping to finish a layout of the boys first photo session at home together today! I'm going to use the same photos in both of their albums, so I think I'll just do the same layout twice, then I can move on to something else! I'm hoping to post something later today or tomorrow, but if I don't get time to, I hope you all have a wonderful weekend! The four of us are having a quiet family day at home tomorrow, then on Sunday, Jamie and I are heading to Kings Dominion for a nice grown-up day at the amusement park. ;) Thanks for stopping by! This page is awesome! I love all the photos! That patterned paper is VERY cute! I love the use of OA here too. Great page!! That page turned out so adorable! This is adorable! How funny that Aaron wouldn't let you count his eggs! Little boys can be so funny sometimes. I love the bunny paper also. You are an awesome scrapper! I have a question for you but I don't have your e-mail, could you send your addie to cardsbyronnie@yahoo.com Thanks dear!